Capes are extremely practical things. They cover all forms of clothing, from tailoring to the bulkiest knitwear, without any fussing with sleeves or fit about the waist. They are highly versatile, as well as being warm and a great cover in the rain. I was reminded of this when I finally tracked down a cape I came across in a Portuguese magazine almost two years ago. I had been shown the magazine by my Portuguese mother-in-law; in it photographer Jose Cabral described the recreation of a cape worn by Portuguese shepherds, and later favoured by local monks. The Capote, as it is called, is made of three layers of a heavy wool known as Burel. This is a traditional fabric originating from Manteigas near Serra da Estrela in Portugal and only made in two factories in the country. It is densely woven and has a felted finish; today it is mostly used for throws, blankets and even home décor. The cape is also made in a variation called Surrobeco, which uses an even tighter weave. Jose directed me to Beyond Fabric, the Tumblr blog and retail site run by Miguel Vieira. Miguel has recreated the Capote in four colours. It has a slimmer fit than the traditional garment, a little polyester to the Burel and a sheep’s wool collar rather than the traditional fox. The latter two make them more affordable and the cloth more resistant to rain. Unfortunately, I don’t think I can get away with one. I tried the brown colour and while it is beautiful – and as I said, highly practical – it is just too unusual. If anyone out there is more of a peacock than me, however, I highly recommend the Capote. Images: Menco Nieuwenhuis, buyer at Oger and author of La Couleur Blanche, wearing a Capote. Menco is also the illustrator of the great images on the Viola Milano site, whom I wrote about recently on The Rake. Small world. You can follow the discussion on The Capote – a Portuguese cape by entering your email address in the box below. You will then receive an email every time a new comment is added. These will also contain a link to a page where you can stop the alerts, and remove all of your related data from the site. That cape looks both attractive and practical, but I don’t think I’d wear it either. I feel roughly the same way about most hats. It hurts when you end up shying away from something which is good in every way, just because it looks too far out. I think the main reason that it hurts is because you know you’ve made a plea bargain with the real world just because you didn’t have the cojones to do as you like and just wear the thing. The burel cloth was used to cover tables, and that’s where the word “bureau” comes from. For me it’s the sheep collar that pushes the coat into the peacock world. Moving the coat further from its traditional roots – perhaps it would look less unusual if it had a hood that fell back like a duffel coat. The fabric drapes very nicely. With your eye for proportion and color and Lorenzo Cifonelli’s creativity, a Permanent Style x Cifonelli cape project for 2014 could be really interesting. Just a thought. Happy New Year. Thanks Scott, interesting comments. 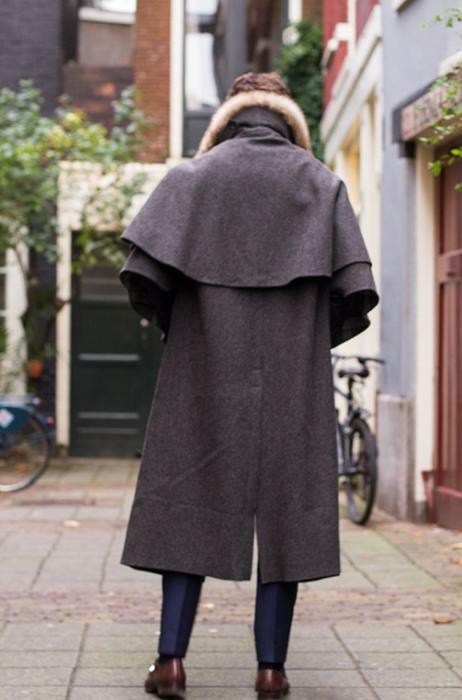 The collar is a traditional feature of the Capote, which is over a century old, but I agree it is a little dandyish and a hood would be very practical. I like the idea of a PS/Cifonelli cape but with Lorenzo’s level of work it would be pretty expensive! I agree with the comment concerning replacing the tradiditional collar with a hood of the same fabric as the cape itself. Of course the cape could also be just one fabric, including the collar, with no hood at all. 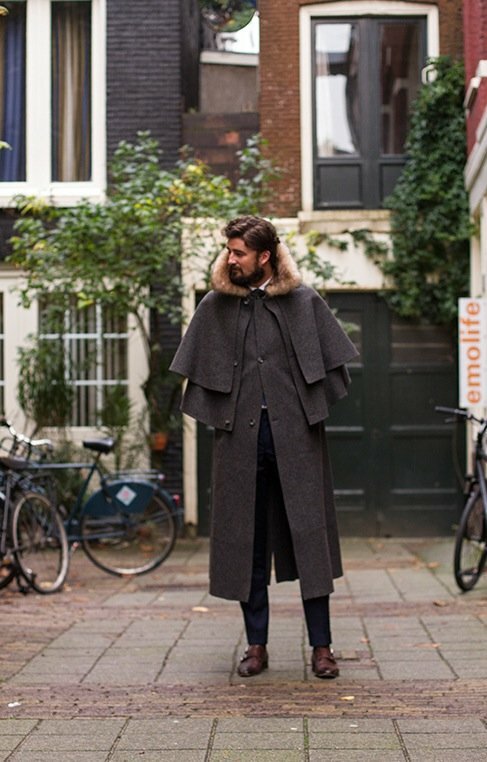 The point is that a cape can be a very practical and attractive addition to ones outer wear wardrobe without the wearer being cosidered a dandy or peacock,if designed properly. I’d suggest approaching a company such as Zegna or Isaia to collaborate on the design of a proper cape. You would get much better distribution that way,but to an exclusive clientele. Come to think of it, John Smedley might be an interesting company to approach on this project as you’ve already done so successfully I believe with the dartmore polo. And don’t forget about Paul Stewart as a possibility either. Why does the cape look weird on younger men? I think I understand your point. My guess is that the cape is a very sophisticated look and simply overpowers most men who cannot pull it off and,as a result, look a bit foolish. I think that it looks weird in younger men because I’m used to see the capa in older men! Whilst I was unsure of this from the picture, I am fairly certain I spotted a gentleman wearing one of these when I was walking down Pall Mall this morning and it looked very smart (not to mention warm and dry!). I saw a portly Parisian chap wearing one in dark green before Christmas. An interesting look. You’re right Paul, it has a lot in common with the Ulster – though without any sleeves and two layers over the top where most Ulsters had one, I believe. Though of course it evolved a lot over the years. Interesting how such functional aspects of clothing travel from country to country. What I forgot to mention of course, is that this Capote is beautiful! It really is a dashing garment! A great merger of quality and practicality, I better start saving up! I read your post and, being a Portuguese from Alentejo myself, I can tell you know much about our culture, specially about capotes! I have shared this post in my company’s Facebook page and I am now following you on Twitter to be up to date with your blog! Thank you for your reply! The collar is actually a traditional symbol for the capote and is what makes it unique, but yes, it is an idea to consider on the following collections! Any other questions feel free to contact me.